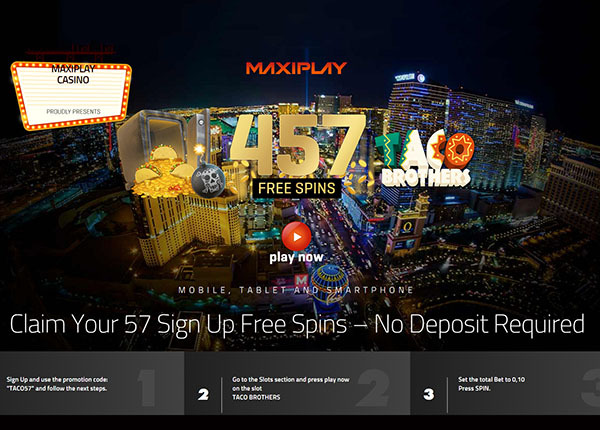 Sign Up at MaxiPlay online casino and use the promotion code: “TACO57” and go to the slots section and press play now on the slot Taco Brothers Slot. Set the total bet to 0,10 then press SPIN. 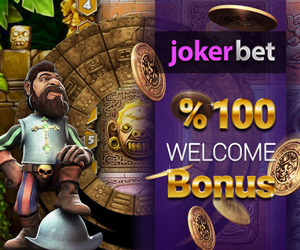 To get additional 400 Free Spins as a welcome bonus, make a first deposit of 20 and then go to the Taco Brothers Slot, set the total bet to 0,10 then press SPIN. The 57 Sign Up Free Spins offer on Taco Brothers Slot is only valid once and for new customers The total Free Spins value of 5,70 is seen as a complementary bonus and wager requirements is set to 50 times. The full wager has to be met within three days. Excluded countries: Poland, Romania, Belarus, Russian Federation and Ukraine. This offer is valid between February 1, 2016 and April 30, 2016.